StringMap is probably most used class in Haxe (I think only Array is used more often). 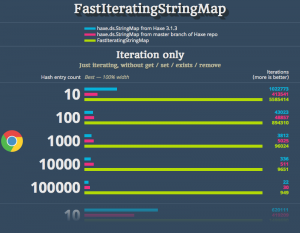 Probably you never use it directly, rather you use Map<String, SomeType>, which use haxe.ds.StringMap under the hood. Important note: haxe team rejected my proposal (and I agree with them), so it is now called LinkedMap, super optimized for js target with default fallback for all other targets. Link. Looks even more good – no more string concatenation for most cases. WAT? Each time you want to iterate (over keys or values), it create a new array, push all the keys into it and return an iterator over this array (new implementation use similar approach). 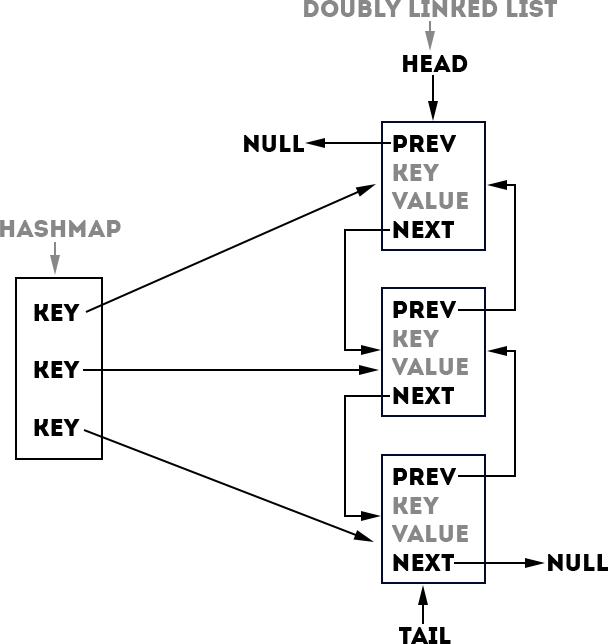 On the one hand hashmap allows to get value by key fast, on the other hand doubly linked list allows to iterate fast. It is almost oblivious that iteration will be super fast, but what about set / get? Huh, quite a lot of code. We need a benchmark! As expected, iteration is super fast! 144% boost in worst case (1000 entries on Firefox), 4313% boost in best case (100000 entries on Chrome). However it is not a realistic situation, usually you would use at least some set, many get and/or exists. And what about case, when you don’t any iteration? FastIteratingStringMap is better than new StringMap on Firefox in most cases, and not-so-worse than old StringMap on Chrome / Safari. Conclusion: it is worth to try FastIteratingStringMap. When is possible to get a benefit? – Yes, because the is an iteration and the method is called often. – No, because the is no iteartion at all. Currently it is included into zame-haxe-miscutils library. Yep, I’ll do it, just want to to support flash target before pulling.